A passionate woman of the theatre, Marcelle Dubois is an executive and artistic director, playwright, and theatre director—a shining star in Québec’s contemporary theatre scene. In just 15 years, she has profoundly transformed Québec playwriting, bringing to the stage work that reflects the world we live in, our culture, and who we are. She firmly believes that the work of Québec’s playwrights should feed public debate, and take a stand on the world and issues of today. As an ambassador for Québec theatre, Marcelle Dubois has propelled authors into the spheres of excellence and relevance where culture has fertile ground to develop. The excellent reputation she enjoys in today’s theatre world undoubtedly stems from the sincerity of her commitment, which has informed her work since the beginning. Following studies in literature and dramatic arts at the Collège Lionel-Groulx, and literary creation at the Université du Québec à Montréal, she founded the Théâtre les Porteuses d’aromates in 2000. 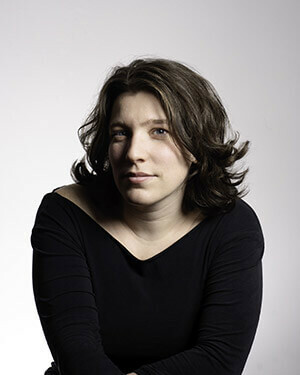 In 2001, she conceived another project, the Festival du Jamais Lu, a tribune for up-and-coming playwrights. At the beginning, Jamais Lu was a showcase; today it is an annual festival of theatrical literature featuring the works of some 30 playwrights. Theatre-goers have a chance to discover the work of young playwrights who have not yet been produced before an audience, and hear work that would never be heard in any other theatre in the city. Initially held only in Montréal, the event is now also produced in Québec City and Paris. Many plays presented in our theatres, including those of François Archambault, Larry Tremblay, and JeanMarc Dalpé were read for the first time on the boards of the Jamais Lu, and some three quarters of the work discovered at Jamais Lu has later been produced, including the film Monsieur Lazhar, which was nominated for the Oscar award. Later, in 2011, Marcelle Dubois joined forces with seven other artists to found a new theatre, Aux Écuries. It houses several emerging companies and is a theatrical initiative dedicated to new talents. Not only is it a space for creation that encourages projects with close ties to current issues, it also reaches out to the community with its literary salons. Marcelle Dubois brings to it all her creativity and leadership and helps to develop the talent and potential of numerous young dramaturges and artists. In addition to her many theatre projects, Marcelle Dubois has given numerous talks, here and in France. Recently the Conseil québécois du theatre honoured her with the Prix Sentinelle. Always eager to share her knowledge and experience as a coach, she has also written for young people and gives volunteer talks on playwriting in the schools of the Villeray neighbourhood to open up the creative world to the young and show them the beauty of free expression! Making theatre accessible is the formidable creative commitment of this woman of distinction!